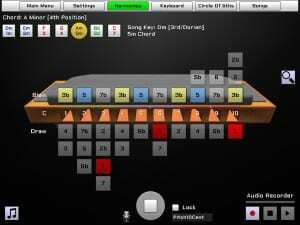 HarpNinja V2.5 PC, OSX, & iPad versions are released. Please re-download the PC demo version and install over your existing version to update. For OSX open the Mac AppStore and you should automatically be able to update. BUG ALERT: Despite best efforts a couple of minor bugs slipped into the OSX/iPad versions. These have been fixed already and will be deployed asap. Apologies! HarpNinja Android for tablets is undergoing final testing, as are the iOS/Android smartphone versions. A few changes between V2.2.1 have been rolled up and are being released as V2.5. A major change was a UX/UI redesign to make it easier to deploy to the upcoming Android and smartphone versions, in addition to performance improvements and various bug fixes. UI/UX redesign – new tab menu bar and smoother workflow.